I pass into a medium-sized room accommodating an array of long tables, each with two boards spaced equally along the length of it. The lighting in the room is quite good, and there is a relaxing contrast of colours between the simple light grey tables and the royal blue carpet. I walk over to sit down at one of the boards where an Indian player in his 20's is seated, gazing over the board as Black - he has just played his move, and now it's my turn as White. 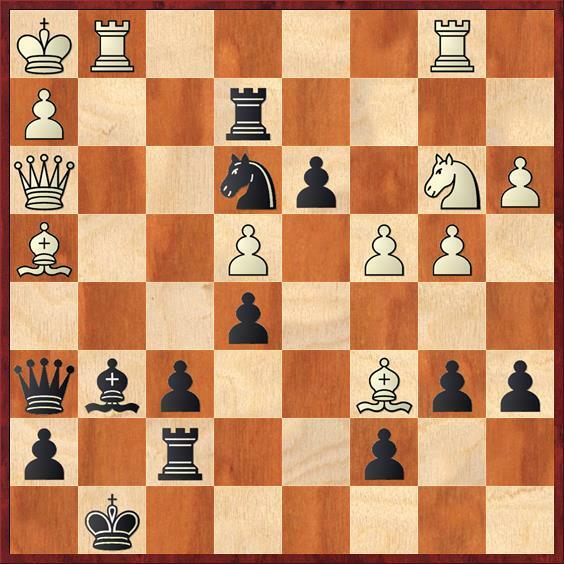 It had been a hard-fought game, and I was determined to force a draw in this position with perpetual check - I began analysing both 1.Qb6+ and 1.Qe8+, as they both seemed decent. After 1.Qb6+ I calculated that my queen keeps checking along the 6th rank until the black king reaches h8, when h6 is unavailable because of the queen on d2, but I'll have alternative checks then. Seems alright, I thought, and I proceeded to check how 1.Qe8+ might turn out. I keep checking along the e-file, restricting the king on the queenside - this also looks like it might achieve a draw. It was difficult to decide between the two moves, and I only had about two and a half minutes left on the clock, with increment - I was leaning more towards 1.Qe8+, but in the next moment I was sitting on the chair adjacent to the one I was just on - I was Black against an Australian IM on the other board on the same table. 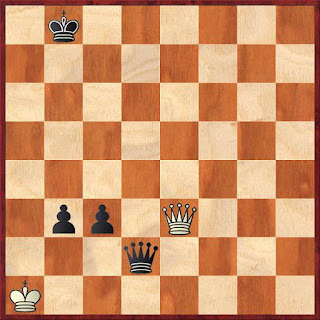 This time I was in a complex middlegame, each having queen, both rooks and minor pieces - and although I had an ambitious trio of knight, rook and passed pawn in White's camp, White had an extra piece and the position seemed unclear. As I began calculating some lines (again, only having 2-3 minutes on the clock), I had a flashback of what I was doing before walking over and sitting down at the board with the queen endgame. In the adjacent room (or rather the invisible other half of the room, which was divided by a wall running two thirds of the room's width), yes...I had been playing another game in the same round. I was White, and had glanced over at the clock, which showed I had the 1:30 hours to begin with, while my opponent's time was down to a minute and a half - he hadn't arrived yet. So, it seemed one win was guaranteed (though I had a miniscule suspicion that the third mystery opponent was coming late on purpose, arriving with seconds on the clock to throw me off), in another game I was fighting for a draw, and for the third it was an unclear position but I somehow didn't feel so confident in winning. N.B. This was a dream I had two nights ago. The first game with the queen endgame is interesting in that I could not comprehend that Qb6+-Qc6+-Qd6+ wouldn't be possible on account of 3...Qxd6, and in fact White's quickest path to a draw is with 1.Qb6+ Kc8 2.Qxb3, which I did not even consider - or maybe its just that the position isn't clearly defined inside the dream. The stress of one game is big enough in a classical tournament, so dealing with simultaneous games felt pretty intense.